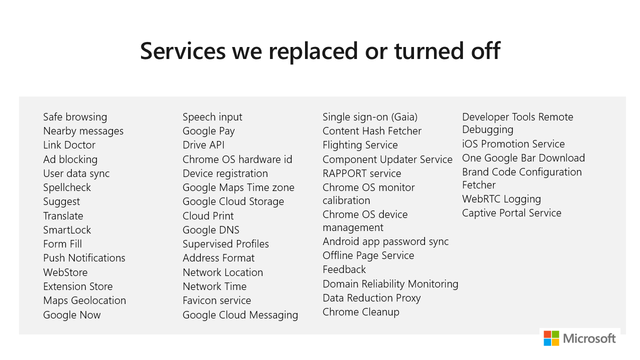 09 April 2019, 13:01 p.m.
Microsoft has provided details of what features are being adopted or abandoned from Chromium for its Edge browser reincarnation. Last year, Microsoft announced it would be scrapping development of its EdgeHTML engine (a decision criticised by some) and switching to Chromium for its Edge browser. In providing reasons why it made the switch, Microsoft cites better web compatibility for users, less fragmentation for developers, and the ability to ‘join forces to evolve the web’. The company has provided a breakdown of what features to expect in the Chromium-based Edge. Microsoft is, of course, now contributing to Chromium. So far, the company has completed around 300 merges in areas such as accessibility (UIA), high contrast, caption styling (Web VTT), native caret browsing, ARM 64, and TSF1. Other areas the company notes it ‘would like to help with’ includes PDF enhancements, battery life, smooth scrolling, editing, layout, dev tools, and web authentication. Battery life was a subject of much debate between Microsoft and Google while developing their own browser engines. Microsoft claimed its Edge browser was more battery-efficient and produced several videos as proof. In the latest video, the Edge device lasted the longest and depleted the battery after 14 hours and 20 minutes while the Chrome device lasted 12 hours and 32 minutes. Microsoft highlighted three areas of investigation where it believes Chromium battery life can be improved: high-resolution timer in message pump, disk cache during video playback, and audio offloading to hardware. Edge was often praised for its scrolling performance. 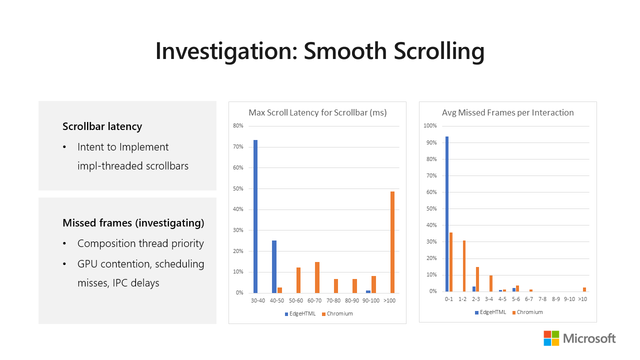 In Microsoft’s tests, the company found much higher latency in Chromium over its EdgeHTML engine and has prioritised it as another contribution area. Microsoft is, of course, looking to port some of its own features and services over to Chromium. The company is currently working on PlayReady DRM, integration with Microsoft services, and single sign-on functionality. Early builds of the Chromium-based Edge are now available.